Things have been particularly busy around here, with a TV interview, a panel discussion and lots of exhibit news, so please scroll through to the end! This fall, the winds of change have blown into my life, setting into motion a series of events that have forced me to come out of the comfort of my stitching cocoon. I’m talking about my exhibit, Liberty and Justice, which was abruptly cancelled in Sept., due to its political content. It’s been an eye-opening experience that has brought stress and sadness, as well as opportunity and a renewed sense of purpose. 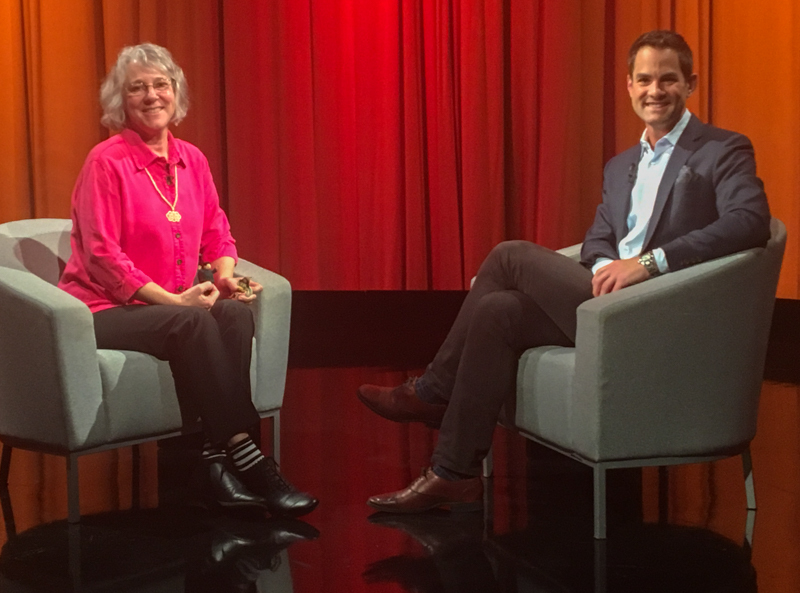 The situation came to the attention of Jared Bowen from WGBH (our local PBS station), who invited me to come on his show, Open Studio. 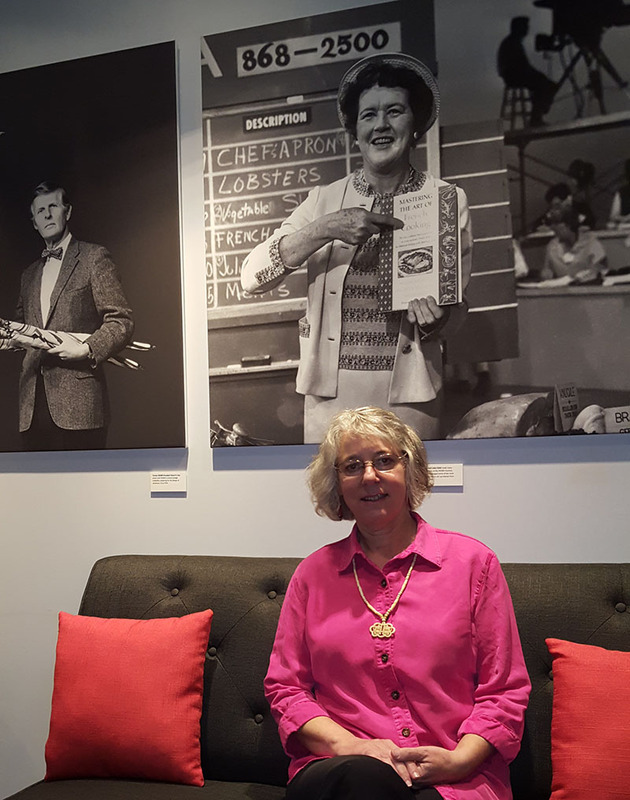 The photo above was taken before the interview while I waited in the green room at WGBH in Boston and the one below is on the set, after we finished filming. You can watch the episode with my interview here. 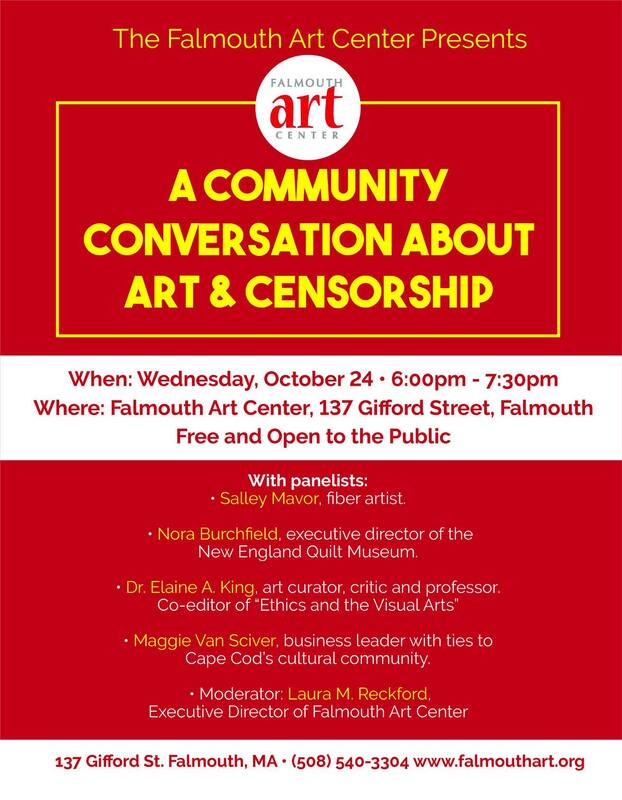 The Falmouth Art Center has taken the initiative to facilitate a Community Conversation on the subject of art and censorship, bringing together a panel that includes a museum director, a curator, critic and educator, a local business leader with ties to Cape Cod’s cultural community and an artist (myself). The saga surrounding my exhibit cancellation has led to a discussion in town about the roles of artists, art nonprofits and gallery space. The event will be on Wed., Oct. 24, 6:00 – 7:30 PM and is free and open to the public. I hope that we can come away with a greater understanding of the role of art in society. Sept. 26 – Dec. 30, 2018. 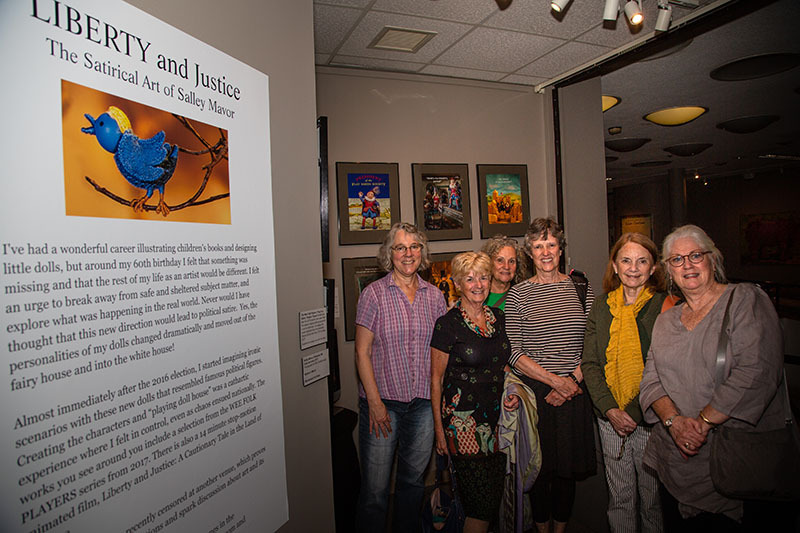 PLEASE NOTE: The Liberty and Justice exhibit will be coming to the Cotuit Center for the Arts, March 2 – April 20, 2019. Opening Reception March 2, 5:00 – 7:00 PM. Artist Talk – “Sweet to Satirical”, Sat., April 13, 2019 at 11:00 AM. The exhibit will include the same items listed above. Fiber and textile artists find unexpected new ways to work with traditional materials on the theme of interconnections and things we have in common across cultures. 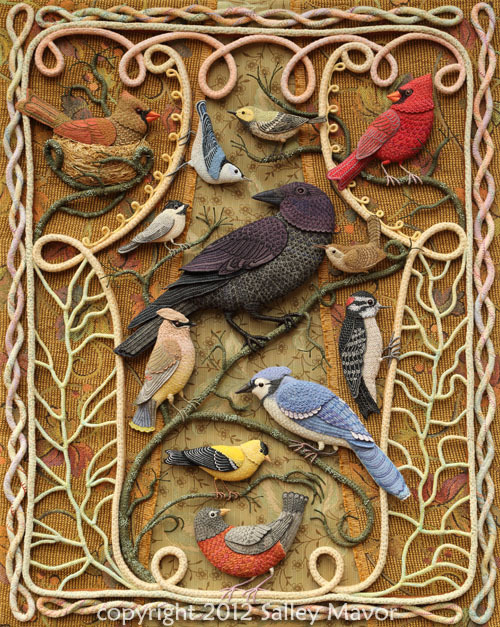 The group exhibit will include 4 of my bas-relief embroidered pieces – Face Time, Cover Up, Whiskers and Displaced. This entry was posted in Events, Exhibits by Salley Mavor. Bookmark the permalink. This is all so great and so important. You have certainly made lemonade out of lemons Salley! Keep being you. I’m happy to see that this has come to a good outcome. I think the blowback from this censorship has actually opened up a whole new avenue that needed to be addressed! Thank for staying true to yourself with grace. Could not agree more! Here Here Salley Mavor! I’m so glad things are being done about the censorship. Interesting interview. I thought it odd that Mr. Bowen didn’t mention, if I’m not mistaken, that viewers could watch the whole video here. Seems rather the point, watching the whole video. Glad you’re getting some serious attention anyway. It’s been fun to watch the whole thing evolve. I love your work and admire your strength and courage. Keep being you. There are lots of people out there that feel the same way about the current political scene. The world is laughing at us because of the low we have reached. A pathalogical lier and nariscal person as our president. How sad we have become. Keep up the good work I’m 100% behind you! Vote and really drain this swamp we currently have.! So glad some people still have common sense ! Hi Salley – wow! My aunt and her friends went to your show in Lowell and loved it. We are hoping to come to the art center Wednesday. Stay strong. Highfield Hall presents wonderful fiber exhibits, I have been there several times when visiting friends in the area. It is very disappointing they cancelled your exhibit. Art is supposed to make people think! We will be traveling to Lowell to see the exhibit, and we are so grateful the Quilt Museum had the courage and intelligence to present your art, uncensored! It was nice to watch your interview on WGBH. Looking forward to the exhibit in Lowell, a city we dearly love to visit as there is so much art and history there. P.S., we still love the fairies and other works! Will the quilt museum have posters for sale? We have not seen the faces and head coverings art works. Thank you for writing, Althea. I’m glad that you plan to visit the Quilt Museum in Lowell. They have some posters for sale. The piece you mention is called Cover Up. It is not in the Lowell exhibit, but will be in “Twisted, Twined and Woven” at the Cahoon Museum in Cotuit. Thanks for including the exhibit at the Sheehan Gallery in this post! I thought it sounded interesting – and I’ve always wanted to see some of your work live & up close! – so I drove 5+ hours from Salem to Walla Walla last week. Loved your piece, loved both exhibits, and had a great time in WW, which has not only grown since my last visit 30+ years ago but is now a hub of wineries and good restaurants. Thanks for inspiring me to have a little adventure! Wow, I’m so impressed that you drove all that way to Walla Walla! And I’m glad it was an adventure worth taking.